Reactionary dentin-like is produced by odontoblasts and Hoehl’s cell after a carious decay, beneath a calciotraumatic line. Five SIBLINGs have been identified, together with the metalloproteinase-2 (MMP-2), whereas SMAD-2 and SMAD-4 are implicated in the synthesis of collagen. Reparative dentin is similar to a bone-like (osteodentin) structure and produced by pulp cells. BMPs, OP-1 or BMP-7, and other growth factors have also been identified in the reparative dentin. 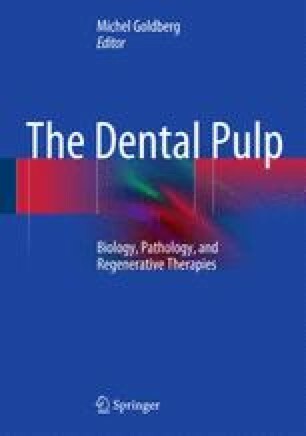 A series of SIBLINGs, fibronectin, ameloblastin, MMP-3, and MMP-9 are implicated in the formation of reparative dentin allowing the closure of a pulp exposure.